The launch of Overwatch is just around corner! To make sure you're ready for deployment on May 24, we've put together a series of launch-day protocols so you'll know what to expect, how best to prepare, and when you'll be able to jump in and officially begin your fight for the future on PC, PlayStation 4, and Xbox One. Players who wish to own a physical copy of the game can also preorder Overwatch at most major retailers worldwide. For a list of supported retailers in your region, visit www.buyoverwatch.com. If you're interested in the Overwatch Collector's Edition, please be aware that this physical, retail-only edition is printed in limited quantities and may already be sold out from your favorite brick-and-mortar or online retailer. Be sure to call around and check with local stores to see if they have the Collector's Edition available! Similar to the Open Beta, Overwatch will launch in all gameplay regions across all platforms at the same time globally. 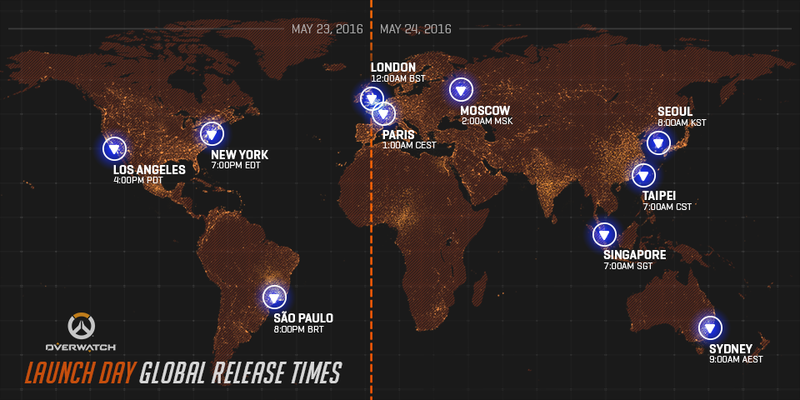 To find out when Overwatch will be available in your region, check out the reference guide below. For timezone assistance, please visit www.thetimezoneconverter.com. Before your watch can begin, you'll first need to install Overwatch on your chosen platform. Every platform is a little different—to install and play on May 24, please follow the instructions below. Step 3: Allow the app to download any pending updates (this process should begin automatically). Step 4a: If you purchased a physical copy of Overwatch, claim your game key in Account Management. Step 4b: If you purchased Overwatch digitally, no additional steps are necessary! Step 5: Click the "Overwatch" icon, located on the left-hand side of the Battle.net desktop app. Step 6: Select your region from the drop-down menu: the Americas, Europe, or Asia. Step 7a: If you've never played Overwatch before on PC, click "Install" to begin the installation process. Step 7b: If you played Overwatch before, allow your game client to update to the latest version. Step 8: Once the game installed and updated, click "Play" to begin! Step 2a: If Auto Download is enabled, Overwatch should begin downloading as soon as it's available. Step 2b: If Auto Download is disabled, go to the PlayStation Store and select "Search" from the top menu. Step 4: Select "Overwatch: Origins Edition" from the search results and then click "Download." Step 5: Once installed, select the Overwatch icon and press "X" to begin! Step 2: Remove the Overwatch disc from its packaging and insert it into the console. Step 3: Follow the on-screen instructions to begin the installation process. Step 4: Once installed, select the Overwatch icon and press "X" to begin! Step 2a: If Instant-On Mode is enabled, Overwatch should begin downloading as soon as it's available. Step 2b: If Instant-On Mode is disabled, go to the Xbox One Home screen and select "My games & apps." Step 3: Locate Overwatch under the "Games" tab and then click "Install." Step 4: Once installed, select the Overwatch icon and click "Launch" to begin! Step 4: Once installed, select the Overwatch icon and select "Launch" to begin! Overwatch will be available for pre-download on Windows PC no later than Friday, May 20, and is currently available for pre-download on Xbox One. If you're playing on a PC, your Battle.net desktop app should automatically begin the download process as soon as the update becomes available. If you're playing on Xbox One, make sure your console has Instant-On power mode enabled. While we've worked hard to provide the best launch experience for all players heading into Overwatch, should you require troubleshooting for any of the above steps, or if you happen to encounter issues on launch night, don't hesitate to contact us! We'll be on standby in the official Overwatch forums and on @BlizzardCS—plus, our Customer Support Portal is just a few mouse clicks away. And don't forget: For all the latest game news and updates, be sure to follow Overwatch on Facebook and Twitter. Cheers, loves! We'll see you on the battlefield.